The original compounds are hydrophilic carbon clusters functionalized with polyethylene glycol, known as PEG-HCCs and created by Rice and Baylor scientists five years ago. The particles help neutralize ROS molecules overexpressed by the body's cells in response to an injury before they damage cells or cause mutations. The new particles, called PEG-PDI, consist of polyethylene glycol and perylene diimide, a compound used as a dye, the color in red car paint and in solar cells for its light-absorbing properties. Their ability to accept electrons from other molecules makes them functionally similar to PEG-HCCs. They're close enough to serve as an analog for experiments, according to Rice chemist James Tour, who led the study with University of Texas biochemist Ah-Lim Tsai. "This allows us to see the structure of these active particles," Tour said. "We can get a view of every atom and the distances between them, and get a lot of information about how these molecules quench destructive oxidants in biological tissue. "Lots of people get crystal structures for stable compounds, but this is a transient intermediate during a catalytic reaction," he said. "To be able to crystallize a reactive intermediate like that is amazing." 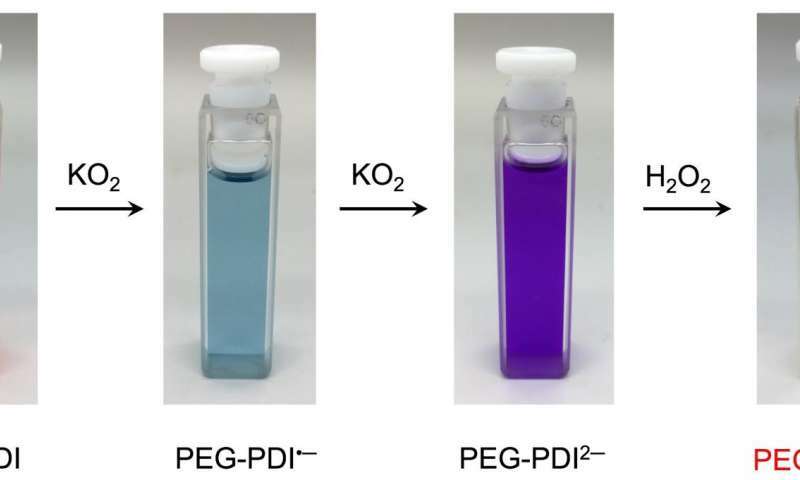 Testing the PEG-PDI molecules can be as simple as putting them in a solution that contains reactive oxygen species molecules like potassium superoxide and watching the solution change color. Further characterization with electron paramagnetic resonance spectroscopy was more complicated, but the fact that it's even possible makes them powerful tools in resolving mechanistic details, the researchers said. Tour said adding polyethylene glycol makes the molecules soluble and also increases the amount of time they remain in the bloodstream. "Without PEG, they just go right out of the system through the kidneys," he said. When the PEG groups are added, the molecules circulate longer and continue to catalyze reactions. He said PEG-PDI is just as effective as PEG-HCCs if measured by weight. "Because they have so much more surface area, PEG-HCC particles probably catalyze more parallel reactions per particle," Tour said. "But if you compare them with PEG-PDI by weight, they are quite similar in total catalytic activity." Understanding the structure of PEG-PDI should allow researchers to customize the molecule for applications. "We should have a tremendous ability to modify the molecule's structure," he said. "We can add anything we want, exactly where we want, for specific therapies." Co-author Thomas Kent, a professor of neurology at Baylor who has worked on the project from the start, noted small molecules have a better chance to get on the fast track to approval for therapy by the Food and Drug Administration than nanotube-based agents. "A small molecule that is not derived from larger nanomaterial may have a better chance of approval to use in humans, assuming it is safe and effective," he said. Tour said PEG-PDI serves as a precise model for other graphene derivatives like graphene oxide and permits a more detailed study of graphene-based nanomaterials. "Making nanomaterials smaller, from well-defined molecules, permits 150 years of synthetic chemistry methods to address the mechanistic questions within nanotechnology," he said.